A journey through wars, plague, terror bombardment, Hans Christian Andersen and Kierkegaard and bad as well as good times. Welcome to the history of Copenhagen. EuroVisionary bring you the story of the 2014 Eurovision host city. The first traces of human activity in the area we now call Copenhagen date back to the stone age, people took advantage of the natural harbor, the overwhelming amount of fish and the mild country side made for farming. But it was not until 1167 when King Valdemar the Great gave Bishop Absalon permission to build a small fortification on the tiny island, now known as Slotsholmen, we see the first ground stones laid down to what in time would become Copenhagen. In its first many years its name was simply Havn (Harbour), but the name changed to Købmands havn (Merchants harbour) due to the heavy trading. Later after a total rebuild of the city`s defence, in order to prevent further attacks mainly from the east Baltic area, in the 1370s the name was changed to København, and the British soon followed with their name, no longer Merchants harbour, but Copenhagen. When it came to good location Copenhagen had a lot of it. 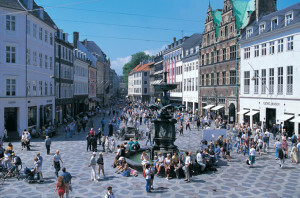 Placed in the middle of the Danish Kingdom (they had Norway, south Sweden and north Germany as well as being masters of the Baltic Sea) and placed between Lund in south Sweden and Roskilde, in those days two important commercial and intellectual cities, Copenhagen took advantage of the situation, and soon the city was the largest in Denmark. In the year 1448, King Christoffer III moved his court and administration to Copenhagen making it the capital. King Christian IV had a great impact on the city’s development. During his rule, buildings like Rundetårn, the round tower (astronomical observatory) and Børsen, the stock exchange, changed the Copenhagen "skyline". And the big build up of the navy demanded a big navel shipyard which is gone now, but the wonderful mast crane building is still standing. Copenhagen came under siege by the Swedish army led by King Karl X Gustav in 1658. The night between the 11th and 12th of February 1659 they tried to storm the city, but a combined force of regular army troops, Dutch voluntary forces and civilians forced them back with heavy losses. In 1711-12 Copenhagen was hit by a plague epidemic that killed 1/3 of the city’s 60.000 strong population. A large part of the city was damaged by the great fire in 1795. During the war against England 1801 to 1807, Copenhagen was the first city to experience a terror bombardment when the British fired rockets against the civilians instead of the military forces defending the city. The bombardment lasted from the September 2nd to the 5th and killed about 7.000 people. The war was all about the Danish fleet, and after the Danish surrender, our mighty swans, the popular name for our fleet, was handed over to the British. Having no more war ships, Denmark was no longer able to defend their merchant fleet, so shortly and surely the money ran out and Denmark and Copenhagen went bankrupt. In order to rebuild the navy a lot of oak trees were planted which should be ready for shipbuilding in 1970s. They were ready but now ships were built of iron. The years to follow were poor in money, but a golden age for art and philosophy, with personalities like Thorvaldsen, Kierkegaard, C. F. Hansen, Hans Christian Andersen and many more. Cholera hit Copenhagen in 1853, making way for new ways of thinking. The small over-populated city needed more space. The old walls came down, light and space came to Copenhagen as did the industrial revolution. In just 50 years the population went from 100.000 to 500.000. Big companies like Carlsberg and B&W as well as others were established. And when the 20th Century started Copenhagen and Denmark was back on its feet again. During the German occupation Copenhagen rebelled against the Danish politicians and the German army and held the city for 5 days in July 1944, forcing the parliament to step down and no longer bow to the Germans. Resistances groups fought the Germans all over the country, and finally Denmark became an allied nation. After the war Copenhagen faced a bit of a down period, development took place in the Copenhagen suburbs, but from the early 1990s the city had put on the turbo and it is again the international capital, with the opera house as the jewel in crown, that spurs the nation and makes the rest of the country a bit envious.